James Bond actor Daniel Craig has accepted a new role. Appointed by the United Nations, Mr Craig will become the first global advocate for the elimination of mines and explosive hazards. His remit will involve raising awareness for the UN Mine Action Service (UNMAS), and political and financial support for the cause. "You have been given a license to kill, I'm now giving you a licence to save," UN Secretary-General Ban Ki-moon told him. 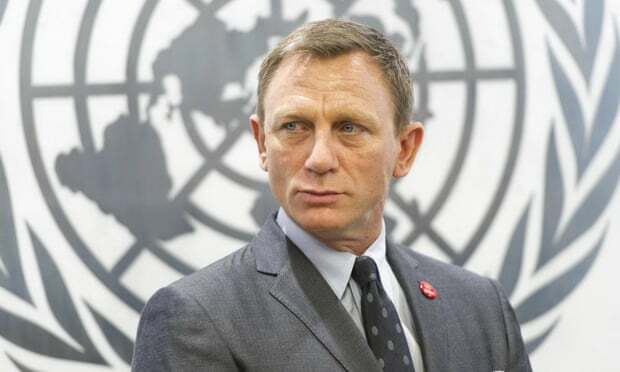 "I'm honoured to accept this role, I'm humbled that I will get the chance to work next to people who are risking their lives every day to help ordinary people live ordinary lives," Daniel Craig said. Go get 'em Dan! What a wonderful cause. And Ban Ki-moon seems like a lot of fun! Would be even cooler if he was appointed "the first global advocate for the elimination of Mimes" though. So I guess Bond won't be setting any mines/charges/etc any time soon in the movies. Wouldn't look good for the cause. Interesting take on the gunbarrel motif in the background.